With great diversity and adaptability, orchids grow from arctic climes to equatorial rain forests. But it's tropical and subtropical orchids that capture the attention of orchid enthusiasts in great numbers. In U.S. Department of Agriculture plant hardiness zone 11, many of these orchid species can be attached to trees or otherwise grown outdoors. In cooler locations of the temperate zone, orchids are grown in pots indoors. Although many types of orchids can remain in the same pot for several years, other types require yearly repotting. With the exception of Phalaenopsis species, timing is key to the success of repotting orchids. The optimal time for repotting orchids is during their active growing phase. 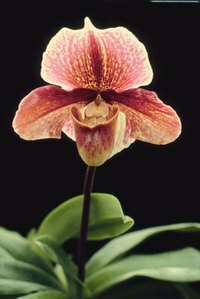 Orchids generally begin a growth period right after flowering, but growth cycles can occur at other times, as well. Signs that your orchid is beginning a growth cycle include new tip growth and white roots at the base of the plant. Certain orchid species develop pseudobulbs at the soil level at the beginning of a growth cycle. Repotting your orchid at this stage allows the plant to acclimate to the new environment with minimal stress as new roots quickly incorporate into the fresh potting medium. Moth orchids (Phalaenopsis spp.) adjust to repotting at any time, regardless of growth phase. At times, orchids must be repotted because of an emergency, such as when a pot is broken or the potting medium becomes badly decomposed before the orchid begins a growth cycle. Broken down potting medium can smother an orchid's roots, so repotting is less likely to cause injury than leaving the orchid in decomposed medium. During emergency repotting, be especially careful not to damage the roots. Another time to repot out of season is after purchasing new plants. Because you do not know how long it's been since your orchid was potted, err on the side of caution and repot as soon as possible. If your plant is in bloom when you buy it, repot at the end of flowering. In "How to Grow Orchids: A Beginner's Guide to Growing Orchids," Fran Barnwell recommends repotting Dendrobium, Miltonia, Paphiopedilum and Phalaenopsis once a year. Every other year, repot Cattleya, Oncidium and Odontoglossum. Vandas and Cymbidiums require repotting every third year. Repotting an orchid does not necessarily require moving up a pot size. Orchids need repotting to replenish root support media, not necessarily because the roots need more space. When a plant becomes root-bound, move up to a pot 1 inch larger than the old pot. Orchids flower more frequently with crowded roots, although an orchid plant will put on size more quickly in a pot 1 inch too large. Orchid growing media include fir bark, sphagnum peat moss, coconut chips, redwood fiber, perlite and hydroponic rocks. Purchase a commercial blend or make your own. Water sparingly with room-temperature water for two weeks after repotting, recommends Barnwell, but keep humidity levels high. Place pots on trays of wet gravel or marbles, and mist daily.